In surprising flashbacks, we lose ourselves in Empress Carlotta’s rocky two-year reign as Empress of Mexico. 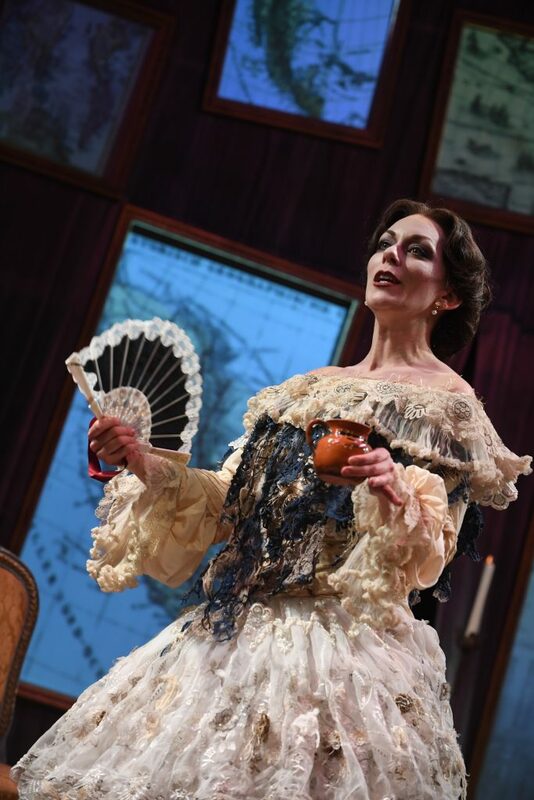 Appointed by the French to rule over Mexico as a colony, we experience the betrayal and illusions of an entitled aristocrat who exerts her privileges in a country she doesn’t even know. Amidst failed relationships and broken government promises, France, Mexico, and the US fight over Carlota’s newly acquired territory. But she’s a naïve figurehead, and she flees back to France and Austria in 1924, a distraught, discarded puppet. 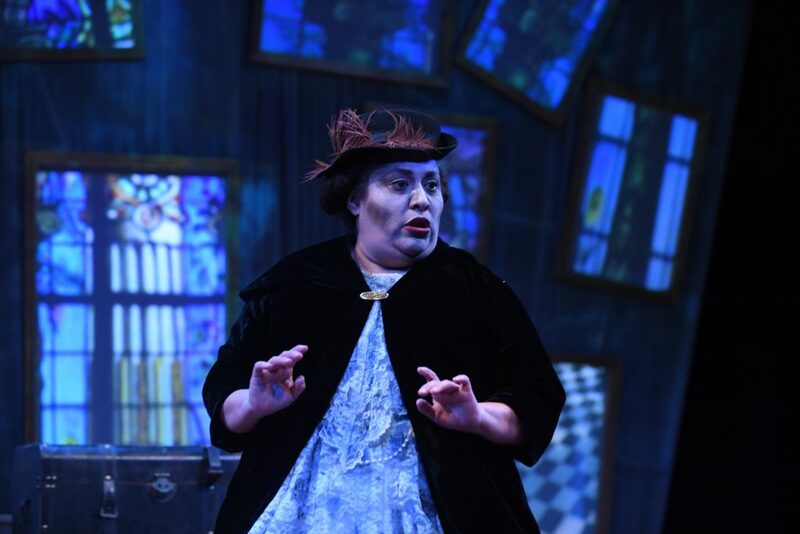 Hysterical, elderly Carlota (Allison F. Rich) appears in a white, lacey dress and blue knitted shawl, cursing her isolation in a distant Belgian castle. Her shrieks of agony and regret leave us shattered. 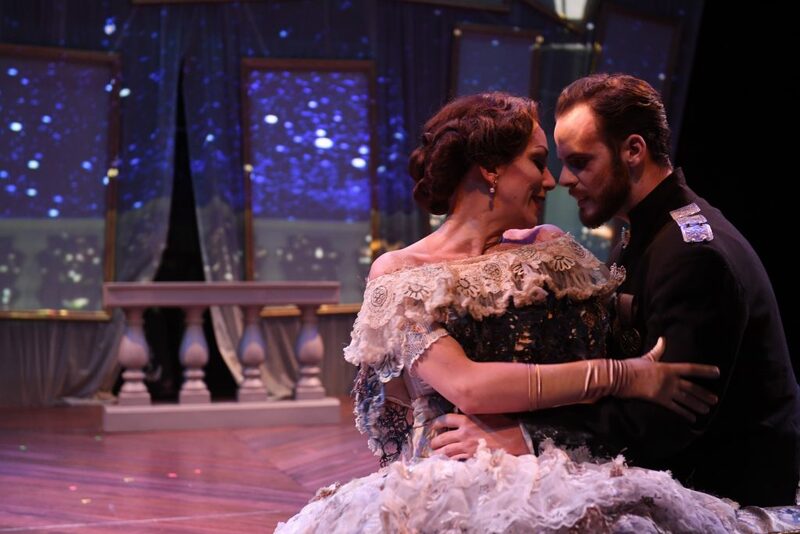 Luis Valdez has written a rich and thoughtful banquet, co-presented by San Jose Stage Company and El Teatro Campesino–with music and fantasy to feast on. 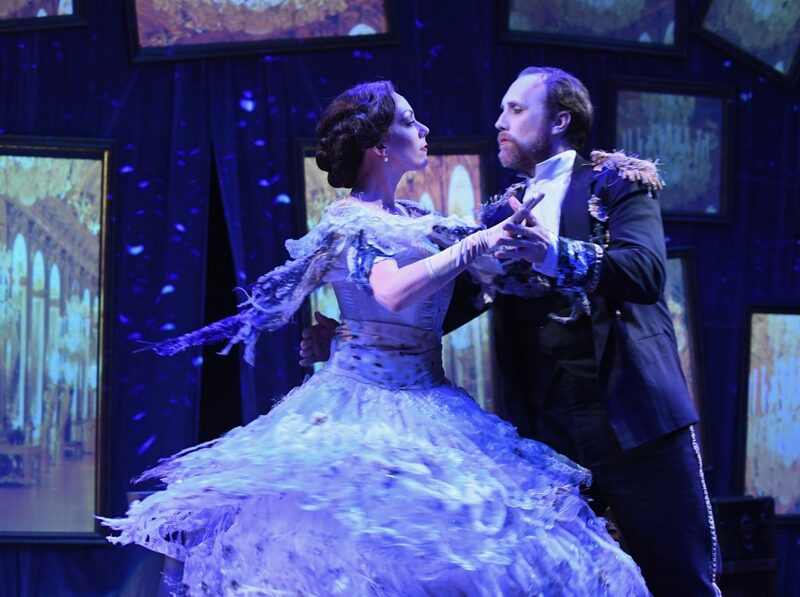 In dream visions of her past glories, Rich exudes confidence as the young, beautiful Carlota, who flirted with the happy-go-lucky Austrian Prince Maximilian (Will Springhorn Jr.). She wants a throne and persuades the youthful and inept prince to become Mexico’s first Emperor. Her self-centered tricks amuse and seduce us. 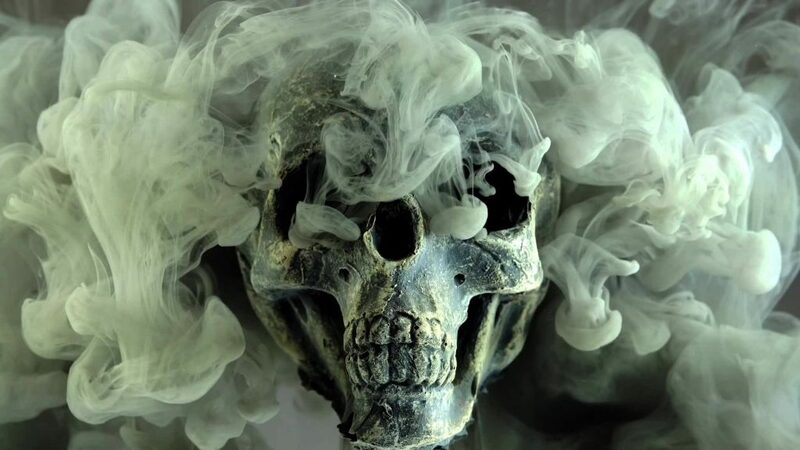 But we are filled with dread because we know her forbidding future. 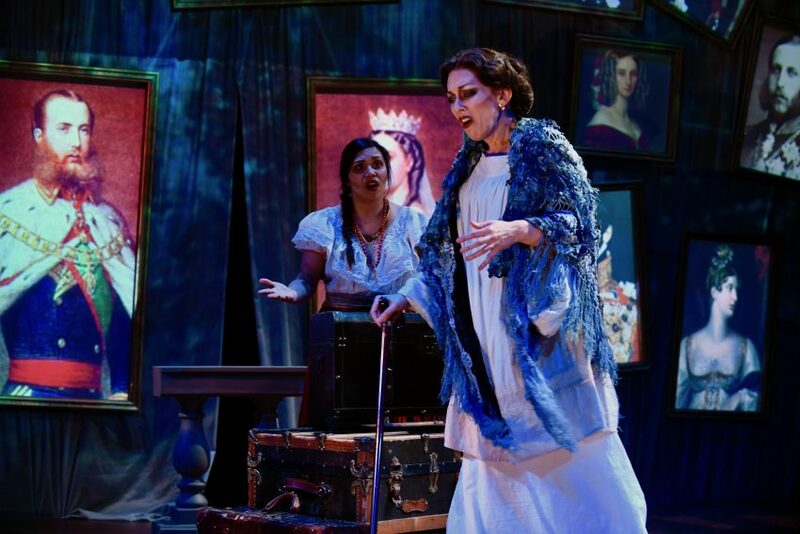 Like the Ghost of Christmas Past, Carlota conjures up the memory of Conchita, Maximilian’s mistress (Jessica Osegueda), who urges old Carlotta to examine her life. 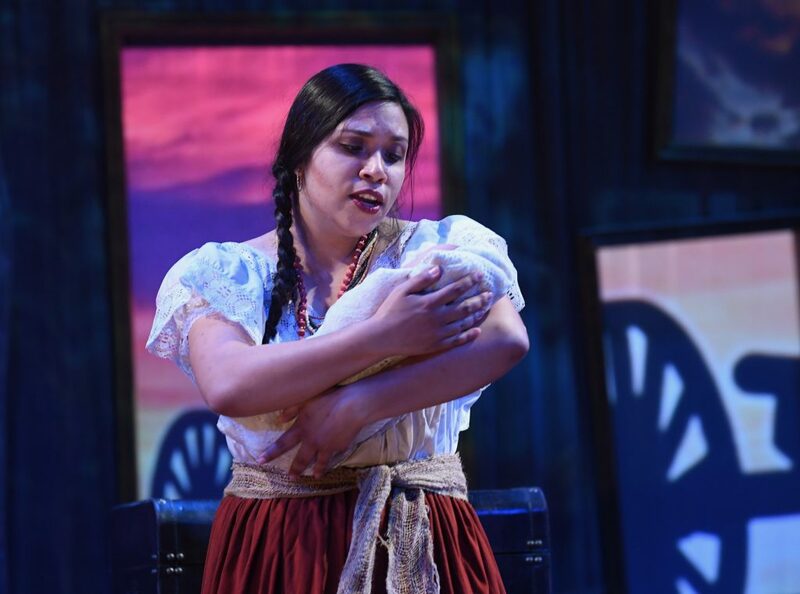 Conchita, a poor and passive native woman, makes a sharp contrast to the deposed, but still aggressive “Empress.” With powerful tirades and songs, Osegueda’s voice lifts us into a romantic Mexican her-story. She enchants with enigmatic, beautiful Spanish melodies. 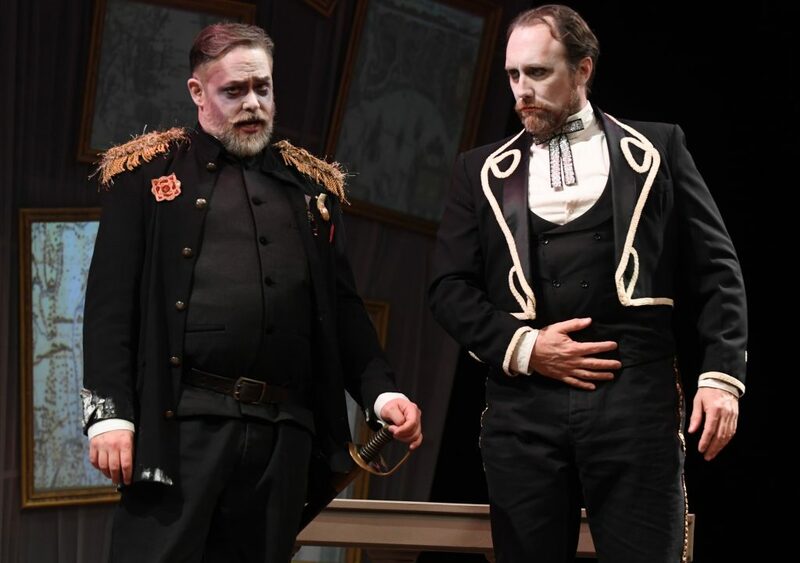 Playwright Luis Valdez and director Kinan Valdez animate the lives of the so-called Emperor Maximilian and Empress of Mexico who “ruled” from 1862-1867, in the face of elected Mexican President Benito Juarez. “Adiós Mamá Carlota” re-imagines Carlota’s dreams and her decline. 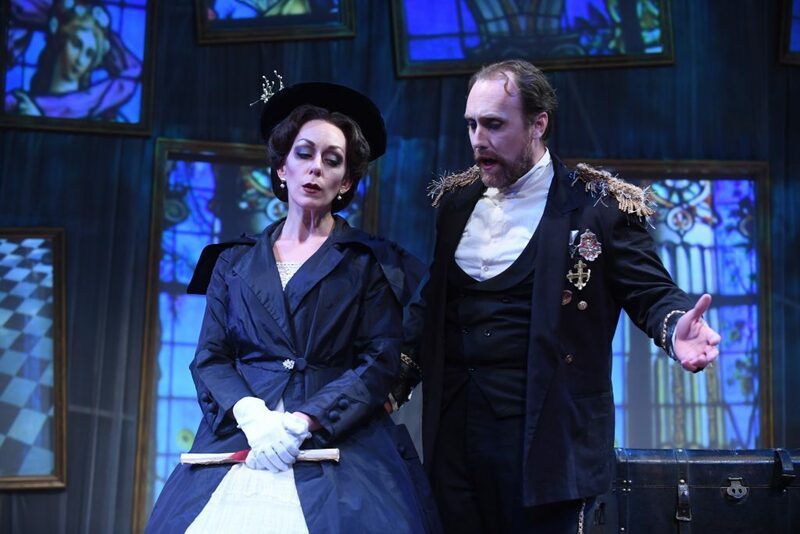 Scenic Designer Michael Palumbo’s Victorian decor adorns the red hardwood stage. Sturdy clothing chests and plush wooden seats offer faded opulence. White wax candles glimmer in medieval holders, shining meekly. Video Designers Dante Carballo and Garland Thompson Jr. create wonderful living picture frames, like Harry Potter’s. Their ornate, moving portraits roll back time, projecting magnificent shows of castles, maps, and battles. Living History. 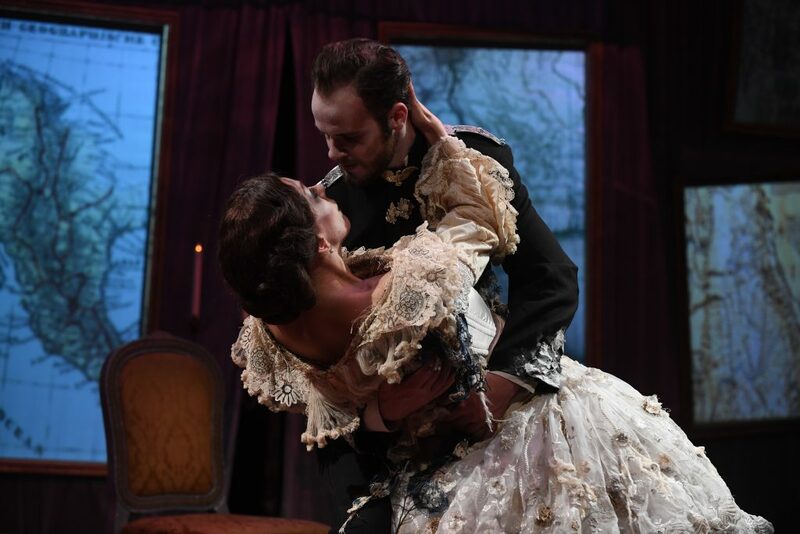 Sound Designer Steve Schoenbeck uses string instruments and refined sound effects to transport us to the Victorian era in Belgium, where the declining Carlota reflects wildly on her imperial adventure. Stomping, clicking military boots signal the appearance of heavily decorated officers. The marvelous music startles and soothes. Like a talented teacher, “Adiós Mamá Carlota” leaves us yearning for more of her strange story. Brilliant innuendos and political puns give her madness meaning for today’s deluded presidents. Definitely a must see, hombre! 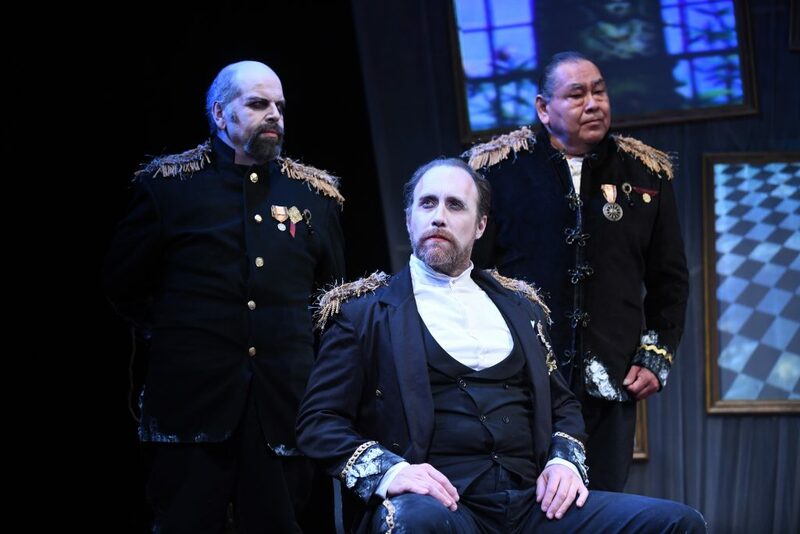 Cast: Allison F. Rich, Will Springhorn Jr., Edward Hightower, Martín Rojas Dietrich, Jessica Osegueda, Estrella Esparaza-Johnson, Sean Okuniewicz, and Noé Yaocoatl Montoya.